Josh Willbanks goes up for the spike. Unforced errors have plagued the Dos Pueblos High boys’ volleyball team this season and visiting San Marcos was more than equipped to capitalize on those mistakes. The Royals swept the Chargers for the second time this season 25-19, 25-15, 25-16 in a Channel League match on Tuesday night at Sovine Gym. San Marcos is currently in the others receiving votes category of the CIF-SS Division 1/2 poll and if the Royals end up getting placed in Division 2 when the playoffs come around the pieces are in place for a deep playoff run. Setter Tanner Stevens runs the show for San Marcos and his stat line against Dos Pueblos, which included 29 assists, seven digs and six blocks is indicative of his impact on the court. For Dos Pueblos (11-9 overall, 2-4 Channel League) a lack of varsity experience has forced coach Ehren Hug to practice patience and emphasize fundamentals. 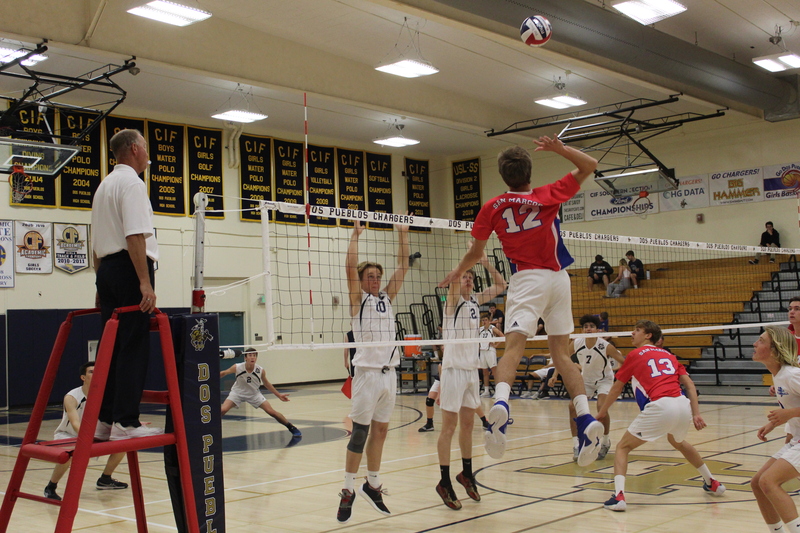 Senior Jack Hogan, who finished with 12 kills, led the Chargers offensively. San Marcos raced out to a 15-6 lead in set one on an ace serve by Stevens, but Dos Pueblos responded with a 11-5 run, cutting its deficit to 20-17 when Toby Still hit into the net. However, San Marcos thwarted the comeback and went on to clinch the first set on a Still ace serve. Dos Pueblos failed to offer much resistance in sets two and three and the Royals clinched the match on a spike through the block by Niko Cvitanic. Cade McLean and Toby Still spearheaded a balnaced San Marcos attack with nine and eight kills respectively.